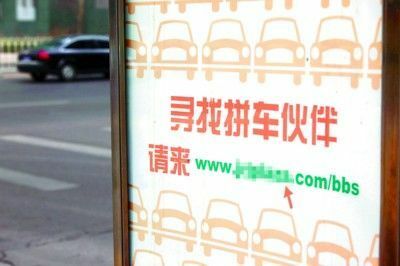 Advertisement for carpool drivers, courtesy of news.sina.com. As seen on Wired.com, residents piloted a carpooling program in Wuhan – a burgeoning megalopolis in central China with a population of 9.1 million people and almost a million cars. Initiated as a way to ease traffic congestion and to promote a sense of community, the carpooling program began Oct. 26 with only 20 drivers and quickly ballooned to over 200 drivers in a matter of a few days. In a country where unlicensed, private drivers (aka “black taxis” or 非法营运) are often penalized for offering lifts to willing patrons, it’s no wonder that carpooling hasn’t taken off sooner in China. Last year Beijing began cracking down on unlicensed taxi drivers, slapping fines between 10,000 RMB (~$1,464 USD) and 20,000 RMB on illegal drivers. In Shanghai the fines are much steeper at 50,000 RMB (~$7,315 USD), or almost seven times as much as it costs to purchase a used car in China. The problem is so widespread that Shanghai Traffic Law Enforcement have even considered jail terms for drivers of black cabs. So far there haven’t been any reports of police accusing carpoolers of driving unlicensed taxis since the program has been in place for about a month.If the program is successful, it could serve as a model for other large cities in China who share similar traffic congestion and pollution problems. It’s encouraging to see the introduction of carpooling, which has been around in the U.S. for quite some time (check GoLoco.org or your local transportation department website for rideshares in your area), being transplanted to a place like China, where it is largely still a foreign concept. Can you imagine how thrilling it would be if cities in China also take on other community-based transport solutions like bike-sharing?